With a wide line-up of indoor units in connection with a flexible piping system, the CITY MULTI Y-Series can be configured for all applications. Depending on capacity, up to 19 indoor units can be connected to maximize an engineer's design options. This feature allows easy air conditioning in each area with convenient individual controllers. The CITY MULTI Y-Series is designed to be your best choice for cooling or heating. The Y-Scries provides a true zoning system. It uses inverter-driven technology to provide intelligent, quiet, and reliable operation. It is directly coupled with the latest controls and protocols to monitor and operate the individual zones and perform building management. All of these benefits are accomplished, while delivering the ultimate in comfort and system management. (Illustration below shows cooling operation. Zoning is identical in heating mode. Zoned cooling or heating system An energy-efficient system that provides maximum comfort. Quiet operation Perfect for sound-sensitive applications like hotel rooms, schools, and libraries, where a quiet conversation is paramount. Easy Installation Little or no ductwork, simple controls, and two-pipe configuration mean less labor and materials used and a fast track to personalized comfort. Ductless or ducted Versatile locations and applications for indoor units. 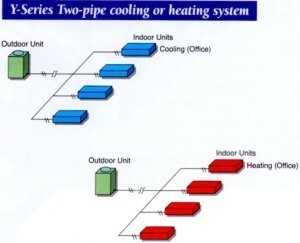 Cooling or Heating Y-SERIES: Configure your piping system to fit any layout. The CITY MULTI Y-Series makes use of a two-pipe refrigerant system, which allows for changeover from cooling to heating, ensuring that a constant indoor climate is maintained in all zones. Available in three sizes, the Y-Series can accommodate up to 19 indoor units for each outdoor unit. 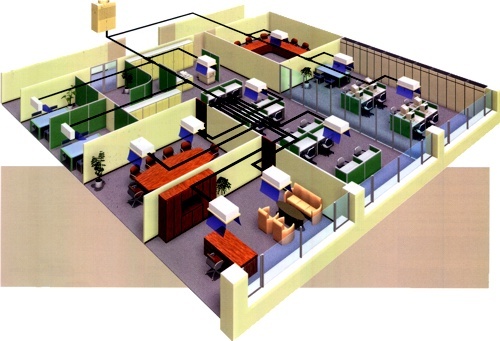 Y-Series and R2-Series can be used in the same building to meet the building's design and each tenant's needs ideally. Up to 2,000 indoor units, across R2-Series and Y-Series outdoor units can be managed by multiple G-50A Centralized Controllers and Mitsubishi Electric's TG-2000 integrated system software. Just like the R2-Series, the Y-Series has one of the smallest outdoor footprints in the industry at 39" x 33" for a 108,000 Btu/h unit. An added advantage is the top discharge design, which allows outdoor units to be installed side by side in a single area, saving space when multiple units are involved. R2-Series and Y-Series outdoor units can be installed side by side to deliver the ultimate in air conditioning for a building while meeting design flexibility. The Y-Series two-pipe system offers great piping design flexibility. Two pipes run from the Y-Series outdoor unit to connect up to 19 indoor units via simple T-branches, headers, or combination of both. 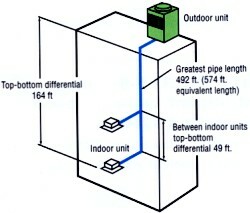 A Y-Series system may have a total combined length of refrigerant piping up to 984 feet one way. The farthest distance between the Y-Series outdoor unit and any one of the 19 indoor units is 492 feet. The outdoor unit can be placed 164 feet vertically above the lowest indoor unit or 131 feet vertically below the highest indoor unit. The Y-Series offers exceptional line lengths that will accommodate just about any commercial application, including multi-story office buildings, assisted living facilities, universities, and many, many more. With a wide line-up of indoor units in connection with a flexible piping system, the CITY MULTI Y-Series can be configured for all applications. Depending on capacity, up to 19 indoor units can be connected to maximize an engineer’s design options. This feature allows easy air conditioning in each area with convenient individual controllers. The CITY MULTI Y-Series is designed to be your best choice for cooling or heating. The Y-Scries provides a true zoning system. It uses inverter-driven technology to provide intelligent, quiet, and reliable operation. It is directly coupled with the latest controls and protocols to monitor and operate the individual zones and perform building management. All of these benefits are accomplished, while delivering the ultimate in comfort and system management. The CITY MULTI Y-Series makes use of a two-pipe refrigerant system, which allows for changeover from cooling to heating, ensuring that a constant indoor climate is maintained in all zones. Available in three sizes, the Y-Series can accommodate up to 19 indoor units for each outdoor unit. Y-Series and R2-Series can be used in the same building to meet the building’s design and each tenant’s needs ideally. Up to 2,000 indoor units, across R2-Series and Y-Series outdoor units can be managed by multiple G-50A Centralized Controllers and Mitsubishi Electric’s TG-2000 integrated system software. Just like the R2-Series, the Y-Series has one of the smallest outdoor footprints in the industry at 39″ x 33″ for a 108,000 Btu/h unit. An added advantage is the top discharge design, which allows outdoor units to be installed side by side in a single area, saving space when multiple units are involved. R2-Series and Y-Series outdoor units can be installed side by side to deliver the ultimate in air conditioning for a building while meeting design flexibility.